Cosy small apartment house "Spassvogel". In the district of In der Nirggen, 900 m from the centre, in a quiet position, south-west facing position. In the house: central heating system. Linen change (suppl. charge extra). In Winter: please take snow chains. Parking at the house. 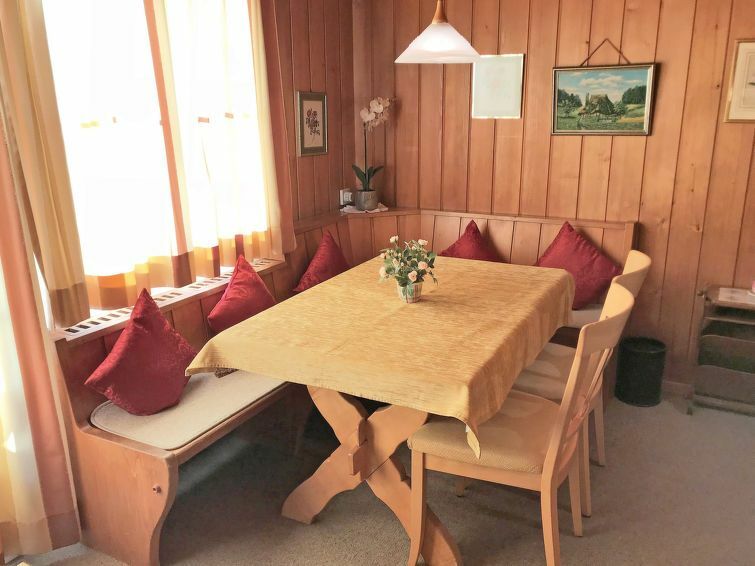 Shopping centre 900 m, restaurant 200 m, bicycle rental 1.2 km, 10 minute walk to the centre, bus stop "Glacier" 200 m, railway station "Grindelwald Dorf" 800 m, outdoor swimming pool 300 m, indoor swimming pool 900 m. Golf course (9 hole) 2.5 km, tennis 3 km, minigolf 1.1 km, sports centre 900 m, mountain railway 400 m, gondola lift 500 m, ski rental 400 m, ski bus stop 200 m, cross country ski track 400 m, children's playground 900 m. Well-known ski regions can easily be reached: First 1500 km, Kleine Scheidegg / Männlichen 400 m. Well-known lakes can easily be reached: Thuner/Brienzersee 18 km. Please note: ski bus (free of charge). 3-room apartment 65 m2 on 1st floor, south facing position. Practical and cosy furnishings: living/dining room with satellite TV (flat screen), radio. Exit to the balcony, south facing position. 2 rooms, each room with 2 beds (90 cm, length 200 cm). Kitchen (oven, 4 ceramic glass hob hotplates, electric coffee machine, raclette grill fondue Set (cheese)). Bath/WC. Balcony 9 m2, south facing position. Balcony furniture. Marvellous view of the mountains. Facilities: hair dryer. Internet (WiFi, free). Reserved parking at the house. Please note: fire extinguisher. 아주 깨끗하고 넓어서 머무는 동안 너무 좋았어요. 흠잡을 곳 없는 숙소입니다. 아주 깨끗하고 넓어서 머무는 동안 너무 좋았어요. 흠잡을 곳 없는 숙소입니다. 4인가족에게 가장 적당할것 같네요. 그룬트역과 가깝고 그린델발트 중심가에서도 걸어서 15분이면 충분합니다. 티비에 KBS월드 채널도 나와요.